For other uses, see Peerage of Ireland and Gaelic nobility of Ireland. From the 12th century onwards, a group of Normans invaded and settled in Gaelic Ireland. These settlers later became known as Norman Irish or Hiberno-Normans. They originated mainly among Anglo-Norman families from England and Wales, were loyal to the Kingdom of England and the English state supported their claims to territory, in the various realms then comprising Ireland. During the High Middle Ages and Late Middle Ages the Hiberno-Normans constituted a feudal aristocracy and merchant oligarchy, known as the Lordship of Ireland. In Ireland, the Normans were also closely associated with the Gregorian Reform of the Catholic Church in Ireland. Over centuries the descendants of the 12th century Norman settlers spread throughout Ireland, and around the world, as part of the Irish diaspora; they ceased, in most cases, to identify as Norman. The dominance of the Norman Irish declined during the 17th century, after a new English Protestant elite settled in Ireland during the Tudor period. Some of the Norman Irish – often known as The Old English – had become Gaelicised and merged culturally with the Gaels, under the denominator of "Irish Catholic". Conversely, some Hiberno-Normans assimilated with the new Protestant elite, as the Anglo-Irish. Some of the most prominent Norman families were the FitzMaurices, FitzGeralds, Burkes and Butlers. One of the most popular Irish surnames, Walsh, derives from the Normans based in Wales who arrived in Ireland as part of this group. Historians disagree about what to call the Normans in Ireland at different times in its existence, and in how to define this community's sense of collective identity. Irish historian Edward MacLysaght makes the distinction in his book, Surnames of Ireland, between Hiberno-Norman and Anglo-Norman surnames. This sums up the fundamental difference between "Queen's English Rebels" and the Loyal Lieges. The Geraldines of Desmond or the Burkes of Connacht, for instance, could not accurately be described as Old English as that was not their political and cultural world. The Butlers of Ormond, on the other hand, could not accurately be described as Hiberno-Norman in their political outlook and alliances, especially after they married into the Royal Family. Some historians now refer to them as Cambro-Normans, and Seán Duffy of Trinity College, Dublin, invariably uses that term rather than the misleading Anglo-Norman (most Normans came via Wales, not England), but after many centuries in Ireland and just a century in Wales or England it appears odd that their entire history since 1169 is known by the description Old English, which only came into use in the late sixteenth century. Some contend it is ahistorical to trace a single Old English community back to 1169 as the real Old English community was a product of the late sixteenth century in the Pale. Up to that time, the identity of such people had been much more fluid; it was the administration's policies which created an oppositional and clearly defined Old English community. Brendan Bradshaw, in his study of the poetry of late sixteenth century Tír Chónaill, points out that the Normans were not referred to there as Seanghaill ("Old Foreigners") but rather as Fionnghaill and Dubhghaill. He argued in a lecture to the Mícheál Ó Cléirigh Institute in University College, Dublin that the poets referred in that way to hibernicised people of Norman stock in order to grant them a longer vintage in Ireland than the (Fionnghaill meaning "fair-haired Foreigners", i.e. Norwegian Vikings; Dubhghaill meaning "black-haired Foreigners", i.e. Danish Vikings). This follows on from his earlier arguments that the term Éireannaigh (Irish people) as we currently know it also emerged during this period in the poetry books of the Uí Bhroin of Wicklow as a sign of unity between Gaeil and Gaill; he viewed it as a sign of an emerging Irish nationalism. Breandán Ó Buachalla essentially agreed with him, Tom Dunne and Tom Bartlett were less sure. It was noted in 2011 that Irish nationalist politicians elected between 1918 and 2011 could often be distinguished by surname. Fine Gael parliamentarians were more likely to bear surnames of Norman origin than those from Fianna Fáil, who had a higher concentration of Gaelic surnames. The term Old English (Irish: Seanghaill, meaning "old foreigners") began to be applied by scholars for Norman descended residents of The Pale and Irish towns after the mid-16th century, who became increasingly opposed to the Protestant "New English" who arrived in Ireland after the Tudor conquest of Ireland in the 16th and 17th centuries. Many of the Old English were dispossessed in the political and religious conflicts of the 16th and 17th centuries, largely due to their continued adherence to the Roman Catholic religion. As a result, those loyal to Catholicism attempted to replace the distinction between "Norman" and "Gaelic Irish" under the new denominator of Irish Catholic by 1700, as they were both barred from positions of wealth and power by the so-called New English settlers, who became known as the Protestant Ascendancy. The earliest known reference to the term "Old English" is in the 1580s The community of Norman descent prior to then used numerous epithets to describe themselves (such as "Englishmen born in Ireland" or "English-Irish"), but it was only as a result of the political cess crisis of the 1580s that a group identifying itself as the Old English community actually emerged. Traditionally, London-based Anglo-Norman governments expected the Normans in the Lordship of Ireland to promote the interests of the Kingdom of England, through the use of the English language (despite the fact that they spoke Norman-French rather than English), law, trade, currency, social customs, and farming methods. The Norman community in Ireland was, however, never monolithic. In some areas, especially in the Pale around Dublin, and relatively urbanised communities in south county Wexford, Kilkenny, Limerick and Cork, people spoke the English language (though sometimes in arcane local dialects such as Yola), used English law, and, in some respects, lived in a manner similar to that found in England. However, in the provinces, the Normans in Ireland (Irish: Gaill meaning "foreigners"), were at times indistinguishable from the surrounding Gaelic lords and chieftains. Dynasties such as the Fitzgeralds, Butlers, and Burkes adopted the native language, legal system, and other customs such as fostering and intermarriage with the Gaelic Irish and the patronage of Irish poetry and music. Such people became regarded as more Irish than the Irish themselves as a result of this process (see also Norman Ireland). The most accurate name for the community throughout the late medieval period was Hiberno-Norman, a name which captures the distinctive blended culture which this community created and operated within. In an effort to halt the ongoing Gaelicisation of the Anglo-Norman community, the Irish Parliament passed the Statutes of Kilkenny in 1367, which among other things banned the use of the Irish language, the wearing of Irish clothes, as well as prohibiting the Gaelic Irish from living within walled towns. Despite these efforts, by 1515, one official lamented, that "all the common people of the said half counties" [of The Pale] "that obeyeth the King's laws, for the most part be of Irish birth, of Irish habit, and of Irish language." English administrators such as Fynes Moryson, writing in the last years of the sixteenth century, shared the latter view of what he termed the English-Irish: "the English Irish and the very citizens (excepting those of Dublin where the lord deputy resides) though they could speak English as well as we, yet commonly speak Irish among themselves, and were hardly induced by our familiar conversation to speak English with us". Moryson's views on the cultural fluidity of the so-called English Pale were echoed by other commentators such as Richard Stanihurst who, while protesting the Englishness of the Palesmen in 1577, opined that Irish was universally gaggled in the English Pale. Beyond the Pale, the term 'English', if and when it was applied, referred to a thin layer of landowners and nobility, who ruled over Gaelic Irish freeholders and tenants. The division between the Pale and the rest of Ireland was therefore in reality not rigid or impermeable, but rather one of gradual cultural and economic differences across wide areas. Consequently, the English identity expressed by representatives of the Pale when writing in English to the English Crown often contrasted radically with their cultural affinities and kinship ties to the Gaelic world around them, and this difference between their cultural reality and their expressed identity is a central reason for later Old English support of Roman Catholicism. There was no religious division in medieval Ireland, beyond the requirement that English-born prelates should run the Irish church. After the Henrician Reformation of the 1530s, however, most of the pre-16th century inhabitants of Ireland continued their allegiance to Roman Catholicism, even after the establishment of the Anglican Church in England, and its Irish counterpart, the Church of Ireland. In contrast to previous English settlers, the New English, that wave of settlers who came to Ireland from England during the Elizabethan era onwards as a result of the Tudor conquest of Ireland, were more self-consciously English, and were largely (though not entirely) Protestant. To the New English, many of the Old English were "degenerate",[according to whom?] having adopted Irish customs as well choosing to adhere to Roman Catholicism after the Crown's official split with Rome. The poet Edmund Spenser was one of the chief advocates of this view. He argued in A View on the Present State of Ireland (1595) that a failure to conquer Ireland fully in the past had led previous generations of English settlers to become corrupted by the native Irish culture. In the course of the 16th century, the religious division had the effect of alienating the Old English from the state, and eventually propelled them into making common cause with the Gaelic Irish as Irish Roman Catholics. The first confrontation between the Old English and the English government in Ireland came with the cess crisis of 1556–1583. During that period, the Pale community resisted paying for the English army sent to Ireland to put down a string of revolts which culminated in the Desmond Rebellions (1569–73 and 1579–83). 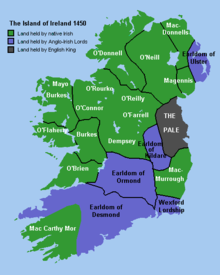 The term "Old English" was coined at this time, as the Pale community emphasised their English identity and loyalty to the Crown, while, at the same time, contradictorily they refused to co-operate with the wishes of the English Crown as represented in Ireland by the Lord Deputy of Ireland. Originally, the conflict was a civil issue, as the Palesmen objected to paying new taxes that had not first been approved by them in the Parliament of Ireland. The dispute, however, also soon took on a religious dimension, especially after 1570, when Elizabeth I of England was excommunicated by Pope Pius V's papal bull Regnans in Excelsis. In response, Elizabeth banned the Jesuits from her realms as they were seen as being among the Papacy's most radical agents of the Counter Reformation which, among other aims, sought to topple her from her thrones. Rebels such as James Fitzmaurice Fitzgerald portrayed their rebellion as a "Holy War", and indeed received money and troops from the papal coffers. In the Second Desmond Rebellion (1579–83), a prominent Pale lord, James Eustace, Viscount of Baltinglass, joined the rebels from religious motivation. Before the rebellion was over, several hundred Old English Palesmen had been arrested and sentenced to death, either for outright rebellion, or because they were suspected rebels because of their religious views. Most were eventually pardoned after paying fines of up to 100 pounds, a very large sum for the time. However, twenty landed gentlemen from some of the Pale's leading, Old English families were executed – some of them, "died in the manner of" [Roman] "Catholic martyrs, proclaiming they were suffering for their religious beliefs". This episode marked an important break between the Pale and the English regime in Ireland, and between the Old English and the New English. In the subsequent Nine Years' War (1594–1603), the Pale and the Old English towns remained loyal in favour of outward loyalty to the English Crown during another rebellion. In the end, however, it was the re-organisation of the English government's administration in Ireland along Protestant lines in the early 17th century that eventually severed the main political ties between the Old English and England itself, particularly following the Gunpowder Plot in 1605. First, in 1609, Roman Catholics were banned from holding public office in Ireland. Then, in 1613, the constituencies of the Irish Parliament were changed so that the New English Anglicans would have a slight majority in the Irish House of Commons. Thirdly, in the 1630s, many members of the Old English landowning class were forced to confirm the ancient title to their land-holdings often in the absence of title deeds, which resulted in some having to pay substantial fines to retain their property, while others ended up losing some or all of their land in this complex legal process (see Plantations of Ireland). The political response of the Old English community was to appeal directly to the King of Ireland in England, over the heads of his representatives in Dublin, effectively meaning that they had to appeal to their sovereign in his role as King of England, a necessity which further disgruntled them. First from James I, and then from his son and successor, Charles I, they sought a package of reforms, known as The Graces, which included provisions for religious toleration and civil equality for Roman Catholics in return for their payment of increased taxes. On several occasions in the 1620s and 1630s, however, after they had agreed to pay the higher taxes to the Crown, they found that the Monarch or his Irish viceroy chose instead to defer some of the agreed concessions. This was to prove culturally counterproductive for the cause of the English administration in Ireland, as it led to Old English writers, such as Geoffrey Keating to argue (as Keating did in Foras Feasa ar Éirinn (1634)), that the true identity of the Old English was now Roman Catholic and Irish, rather than English. English policy thus hastened the assimilation of the Old English with the native Irish. In 1641, many of the Old English community made a decisive break with their past as loyal subjects by joining the Irish Rebellion of 1641. Many factors influenced the decision of the Old English to join in the rebellion, among them fear of the rebels and fear of government reprisals against all Roman Catholics. The main long-term reason was, however, a desire to reverse the anti-Roman Catholic policies that had been pursued by the English authorities over the previous 40 years in carrying out their administration of Ireland. Nevertheless, despite their formation of an Irish government in Confederate Ireland, the Old English identity was still an important division within the Irish Roman Catholic community. During the Irish Confederate Wars (1641–53), the Old English were often accused by the Gaelic Irish of being too ready to sign a treaty with Charles I of England at the expense of the interests of Irish landowners and the Roman Catholic religion. The ensuing Cromwellian conquest of Ireland (1649–53), saw the ultimate defeat of the Roman Catholic cause and the almost wholesale dispossession of the Old English nobility. While this cause was briefly revived before the Williamite war in Ireland (1689–91), by 1700, the Anglican descendants of the New English had become the dominant class in the country, along with the Old English families (and men of Gaelic origin such as William Conolly) who chose to comply with the new realities by conforming to the Established Church. Changing religion, or rather conforming to the State Church, was always an option for any of the King of Ireland's subjects, and an open avenue to inclusion in the officially recognised "body politic", and, indeed, many Old English such as Edmund Burke were newly-conforming Anglicans who retained a certain sympathy and understanding for the difficult position of Roman Catholics, as Burke did in his parliamentary career. Others in the gentry such as the Viscounts Dillon and the Lords Dunsany belonged to Old English families who had originally undergone a religious conversion from Rome to Canterbury to save their lands and titles. Some members of the Old English who had thus gained membership in the Irish Ascendancy even became adherents of the cause of Irish independence. Whereas the Old English FitzGerald Dukes of Leinster held the premier title in the Irish House of Lords when it was abolished in 1800, a scion of that Ascendancy family, the Irish nationalist Lord Edward Fitzgerald, was a brother of the second duke. The following is a list of Hiberno-Norman surnames, many of them unique to Ireland. For example, the prefix "Fitz" meaning "son of", in surnames like FitzGerald appears most frequently in Hiberno-Norman surnames. (cf. modern French "fils de" with the same meaning). However, very few names with the prefix "Fitz-" sound Norman but are actually of native Gaelic origin; most notably FitzPatrick (from the Mac Giolla Phádraig, kings of Osraige) and FitzDermot (Mac Gilla Mo-Cholmóc, of the Uí Dúnchada sept of the Uí Dúnlainge based at Lyons Hill, Co. Dublin). Kilcoyne, derived from the original Gaelic "O Cadhain", emerged in Norman Galway. le Gros or later translation, "le Gras" (anglicized "Grace"). Wall (Anglicized from Du Val). See academic genealogy text Wall family in Ireland (1170-1970). The annals of Ireland make a distinction between Gaill and Sasanaigh. The former were split into Fionnghaill or Dubhghaill, depending upon how much the poet wished to flatter his patron. There are a number of texts in Hiberno-Norman French, most of them administrative (including commercial) or legal, although there are a few literary works as well. There is a large amount of parliamentary legislation, including the famous Statute of Kilkenny and municipal documents. The major literary text is The Song of Dermot and the Earl, a chanson de geste of 3,458 lines of verse concerning Dermot McMurrough and Richard de Clare, 2nd Earl of Pembroke (known as "Strongbow"). Other texts include the Walling of New Ross composed about 1275, and early 14th century poems about the customs of Waterford. ^ Canny, Nicholas, From Reformation to Restoration : Ireland 1534–1660 (Dublin 1987); the third volume in the Helicon history of Ireland paperback series. ^ Cited in S. J. Connolly, Contested Island: Ireland 1460–1630 (Oxford, 2007), p. 29. ^ See Vincent Carey, 'Bi-lingualism and identity formation in sixteenth-century Ireland' in Hiram Morgan (ed. ), Political Ideology in Ireland, 1541–1641 (Dublin, 1999) for a study of this aspect of Old English culture and identity. ^ Colm Lennon, Sixteenth Century Ireland, The Incomplete Conquest, p 322, "Despite the proclamations of O'Neill... there is little evidence that the townsfolk and Pale gentry were in sympathy with the Ulster chieftain's war, and in this they had the backing of leading Jesuits such as Father Richard Field SJ. Whatever their common Catholicism, any links with the Spanish monarchy were strongly eschewed by the vast majority of those of 'Old English' origin in Ireland." ^ See Art Cosgrove, 'Hiberniores Ipsis Hibernis', Late Medieval Ireland 1370-1541 (Dublin, 1981) for a discussion of the differences between 'Gaill', 'Gaedhil' and 'Saxain' in late medieval Irish identity. Fionnghaill, fair-haired foreigners, were of Norwegian descent; Dubhghaill, dark-haired foreigners, were of Danish descent. The former had longer roots in Ireland and thus was, as Brendan Bradshaw demonstrated, used as a greater compliment. Normans were, of course, originally "men of the North" i.e. from Scandinavia. See CELT (http://www.ucc.ie/celt/publishd.html) for English translations of these distinctions made in all the principal late medieval Irish annals. Healy, John (1892). "The Anglo-Norman Invasion" . The ancient Irish church (1 ed.). London: Religious Tract Society. pp. 181–86.